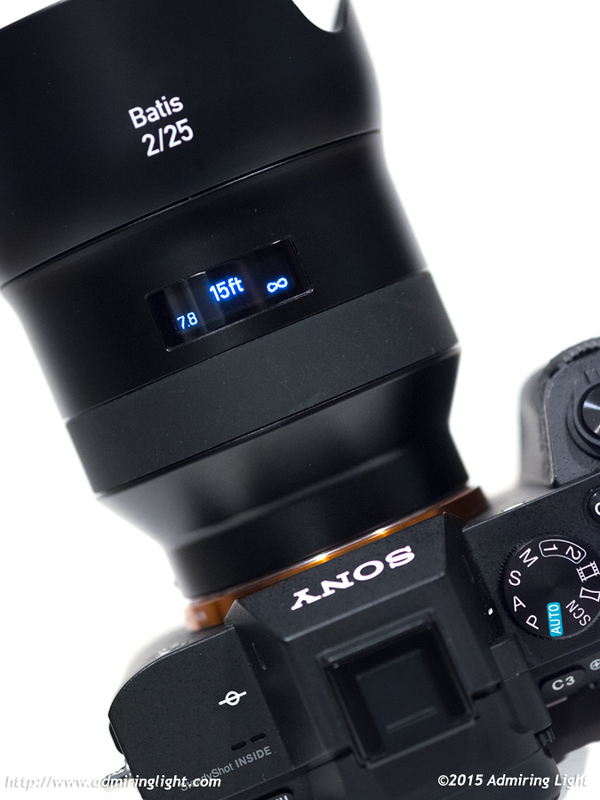 Zeiss has been making waves the past few years, and their two lines in the full-frame Sony E-Mount have largely been well received. 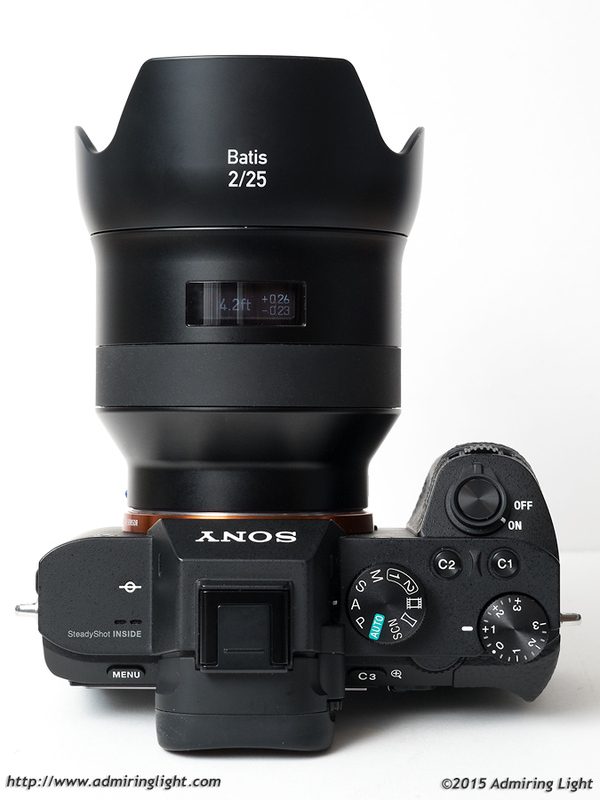 Today I’m looking at the wide-angle member of the autofocus 25mm f/2 Batis. This lens is a new optical formula based on the Distagon design, rather than the Biogon design that is often used by Zeiss for cameras with short register distances. This wide-angle prime is poised to provide outstanding imaging characteristics in a relatively lightweight, weathersealed body. Let’s see how it performs. If you’ve read my review of the Batis 85mm f/1.8, the following section will sound quite familiar, as the two lenses share an identical design philosophy as well as nearly identical sizes, with the Batis 25mm being the same diameter, but slightly shorter than its telephoto brother. Otherwise, the lenses look identical. The Batis 25mm f/2 is constructed almost entirely of metal, with the electronic depth of field scale and flat rubber focus ring the only things that break up the gentle curved lines of the lens body. The same design philosophy is present in the Zeiss Otus, Milvus and Touit lines as well, and it’s quite aesthetically pleasing to my eye. 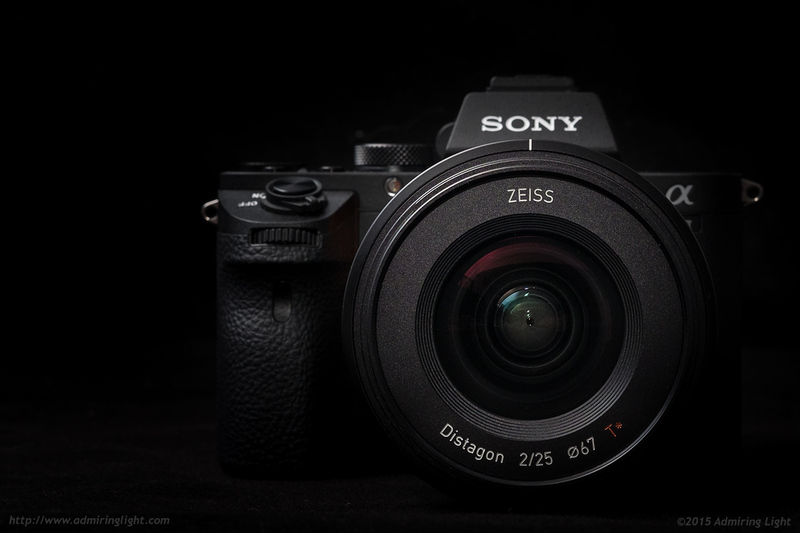 It’s modern and sleek, though lacks some of that old-school charm of some of Zeiss’ older manual focus lenses. Like these other lenses, the included petal-shaped lens hood integrates beautifully with the gentle flare at the end of the lens, allowing it to integrate nearly seamlessly with the rest of the lens body. The main portion of the barrel is quite wide and looks a bit large on a small mirrorless camera, but the Batis 25mm isn’t as heavy as it looks, so it handles quite well on my A7 II. The smooth rubber focus ring is something I’ve never particularly cared for, as it reduces the tactile feedback of manually focusing, but the action of the focus ring is smooth and precise. The Batis 25mm feels like a quality piece of kit, with very tightly assembled parts and zero flex anywhere in the body. The lens has a blue rubber gasket to provide weather sealing at the mount. I shot for about 20 minutes in light misting rain, and while lens and camera did not get particularly wet, everything worked wonderfully both during and after the shoot. Portions of the section below were taken from my Batis 85mm review. That OLED display that sits in the middle of the lens is used to display focus and depth of field information in either feet or meters, depending on your preference. I’m one who really loves the OLED display on the Batis lenses. It was quite useful on the Batis 85mm, but it’s even more useful on a wide-angle lens where landscape use is prominent and hyperfocal focusing is commonplace. A standard depth of field scale for manual focus works fine, but with nowhere near the precision of the one here. The display flashes “ZEISS” when the camera is powered up or down, and the user can select when it is on during operation. You can choose to always have the display active; you can choose to only have the display active in DMF or MF mode, or you can choose to turn the display off entirely. If set to on or if you’re in DMF, the lens will show you the focus and DOF scale when focus is achieved. This can be nice, but isn’t the pinnacle of importance. However, in manual focus, the display shines. When in manual focus mode, the focus distance is shown in the center, with the near and far points of focus for the chosen aperture on either side. If you’re focusing close up, the distance will be shown with a +/- distance in hundredths of a foot to denote depth of field. It’s a quick and easy way to gauge exactly what will be in focus. Where this is most handy is in setting hyperfocal distance. Simply select your aperture and adjust the ring until the right hand side of the focus scale changes to infinity. In my experience, these markings are very accurate, and hyperfocal distance indeed will keep distant subjects sharp. The OLED display makes finding the hyperfocal distance very easy. If you are wondering how to change the settings for the OLED display, it’s done by turning the focus ring. Turn the focus ring to the left repeatedly and eventually you’ll see “ON MF OFF” displayed. Keep rotating left to pick between these settings for when the display will be used. Once the ring is turned right again, your setting will be saved. To switch between meters and feet, simply rotate the ring to the right repeatedly until the display changes to your units of choice. The Batis 25mm f/2 focuses silently and quickly. I had no issues during the test period with focus accuracy as well, with the lens locking on swiftly and precisely where the focus point was placed. While a super-wide lens like the 25mm f/2 isn’t going to be used for continuous focus tracking in most circumstances, the lens focuses fast enough to keep up with most action, at least to the capability of my A7 II. 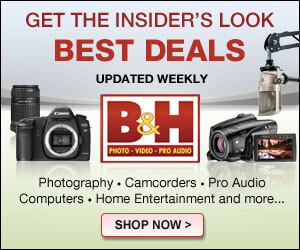 any thoughts on the batis vs the sony 28mm f2,aside from price and slightly wider fov? My copy is sharp from edge to edge even wide open. There might be a little less resolution in the extreme corners but you have to magnify the image by 200% to see that. Color and rendering is also very special. Bokeh is nice actually and one can see this in the samples here, too. I have to disagree on that with Jordan, even though from a technical point he is right. Still very pleasant oof parts that never look distracting. The 28mm Sony lens is nowhere near as good. I tried two copies of that lens because i would have loved to buy a smaller and lighter lens for my system for 1/3 of the price. Did not work. The Sony lens is soft in the corners and even in the center of the frame it is not on par with the Batis. It is much softer across the frame when you compare it to the 35 2.8 Sony, 55 1.8 Zeiss/Sony, the 85 1.4 Sony or this Batis. wonderful stuff. was hoping the sony might be as good stopped down. I have literally only played with the Loxia 21mm for about 8 minutes at PhotoPlus, of which I took around 10 photos. I really can’t say definitively at this point. I will be reviewing the Loxia when it’s available. Thanks for the article. Exactly what I was looking for. Pingback: ??????? Batis 2/25 ?????????????????? | ????????????? Cool article. I use the 18mm Batis and the 21mm Loxia quite a bit but was thinking about edging up a bit towards a more standard lens. Very helpful. Pingback: ??? ?Batis 2/25???????????????????????????? | ???????????? ?